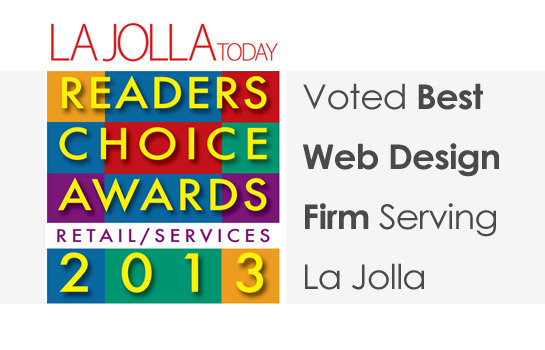 We’re excited to announce that Modmacro was named the gold medal winner of the La Jolla Today Readers Choice Awards 2013 for Best Web Design Firm. La Jolla Today is a twice-monthly newspaper that’s published both in print and online. The 2013 awards are the newspaper’s 5th annual Readers Choice Awards that La Jolla Today has hosted. Ballots were printed in La Jolla Today for several weeks and also posted on the website, www.sdnews.com. Readers were given the opportunity to vote for their favorite businesses in roughly 80 categories including everything from beauty salons and banks to accountants, attorneys and web designers. The votes were tallied and winners were awarded with gold, silver and bronze awards. La Jolla Today published a 24 page announcement that listed the winners with a brief bio for the top companies. They referred to the document as “your guide to the best of the best in La Jolla and University City”. View the La Jolla Today 2013 Awards. Web design is a saturated industry with low barriers to entry and small companies coming and going constantly. Since our founding, we’ve pushed to build our brand as a trustworthy internet agency that helps grow businesses in serious ways. We’re blessed to have loyal clients who continue to partner with us and rely on Modmacro to drive their marketing strategies. And our success is truly rooted in the success of our clients. While the satisfaction of our clients will always be of singular importance to us, recognition from the community feels good too. And the fact that this award is voted on by local readers makes it that much more meaningful.